The outstanding accuracy and stability of helium magnetometers were demonstrated by the lamp-pumped Low-Field Vector Helium Magnetometer, used on past planetary missions, and also on the Ulysses spacecraft (launched in 1990), now in polar orbit around the sun. 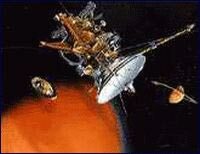 The Cassini-Huygens spacecraft, launched in 1997 and due to arrive at Saturn and its moon Titan in 2004, uses a Vector/Scalar Helium Magnetometer (V/SHM), provided by the Jet Propulsion Laboratory (JPL), to measure magnetic fields. The scalar-mode control electronics for this instrument were designed by Polatomic. The Miniature Vector Laser Magnetometer (MVLM) is being developed by Polatomic for NASA’s Earth Sciences Technology Office (ESTO) to measure the Earth’s magnetic field from spacecraft in Earth orbit. The Earth’s magnetosphere protects the Earth from incoming radiation from space, and can be separated into an internal field arising from sources within the solid earth, and an external field component, which is driven by interactions with the solar wind and solar radiation. Data from the measurement of these fields allow for estimation of the internal dynamics of the Earth’s core, the structure and dynamics of the lithosphere and crust, and the interaction between the Earth’s field and the solar wind – a possible influence on Earth’s climate. Polatomic’s Self-Calibrating Vector Magnetometer (SVM) technology represents a substantial advance in the state of the art of helium magnetometer design. Magnetic field measurement instruments aboard spacecraft traditionally require two different types of sensors – a fluxgate magnetometer to provide vector field measurements, and a scalar magnetometer to provide scalar measurements and also to calibrate the fluxgate magnetometer. With the SVM, Polatomic plans to provide all these functions in a single magnetometer containing one helium cell. For calibration and scalar measurements, either Optically-driven Spin Precession (OSP) or Magnetically-driven Spin Precession (MSP) will be used. For vector measurements, the SVM will use a Bias Field Nulling (BFN) procedure, which employs tri-axial coils surrounding the cell.